Our Socks was a sweet boy.…a lover boy. When you looked at him or walked by him he would purr, or meow….without fail. We loved his gentle disposition. He would have a “conversation” with you, always vocal in response to your voice. In the evenings he would settle on our laps and snuggle himself in. 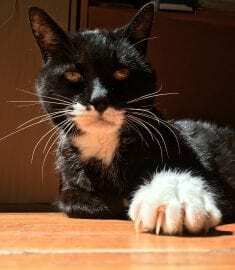 He was a healthy fellow—18 years old when we lost him suddenly. Our hearts were broken. The idea to attempt to clone him came to us in our moment of despair and we thought, under the circumstances, it was an outside chance to get a viable culture. But to our amazement and joy, the culture was viable. We look so forward to our adventure now to welcome a new Socks into our lives. He will be loved and cherished as a member of our family.